There is this horrible misconception that teachers and mothers always need to put other people’s needs before themselves. However, this dangerous misconception can lead to teacher burnout. We care about our students and our children so much, so of course we want to do everything we can for them. However, while there is a time and a place for putting other’s needs first, we also need to be sure that we are taking time for ourselves. When we don’t take care of ourselves, this is when burnout happens. As a teacher, there is always so much to do! Lesson planning, the never ending stack of papers to grade, staff meetings, the list goes on! And it always seems like it is NEVER done, so you never feel like you can really take a break. Same goes for being a mother. Laundry, dishes, housework, making sure everyone’s needs are met. The work never ends! It’s so easy to get burned out. There is always something to do, so you do it. Then, when you actually find yourself with some you time on a rare occasion, you aren’t always sure what to do with it! If you’ve had so many things that you “have to” do, you may have lost touch of what you actually ENJOY doing! You may not even feel like doing anything because you are so BURNED. OUT. It’s NOT selfish for you to take some time for yourself! In fact, you can only take care of those you care about most when you take care of yourself FIRST. Think about the well-known airplane analogy. In the rare circumstance that you are riding with children in an airplane and the need for oxygen masks arises, who are you supposed to put the mask on first? Yourself! However, this definitely goes against MY natural instincts! I know that I would WANT to put it on my children first! That being said, if I don’t take care of myself first, I may not have enough time to get it on my children. The same goes with life. We need to take the time to take care of ourselves, because we want to be the best we can be to take care of those who we care about. 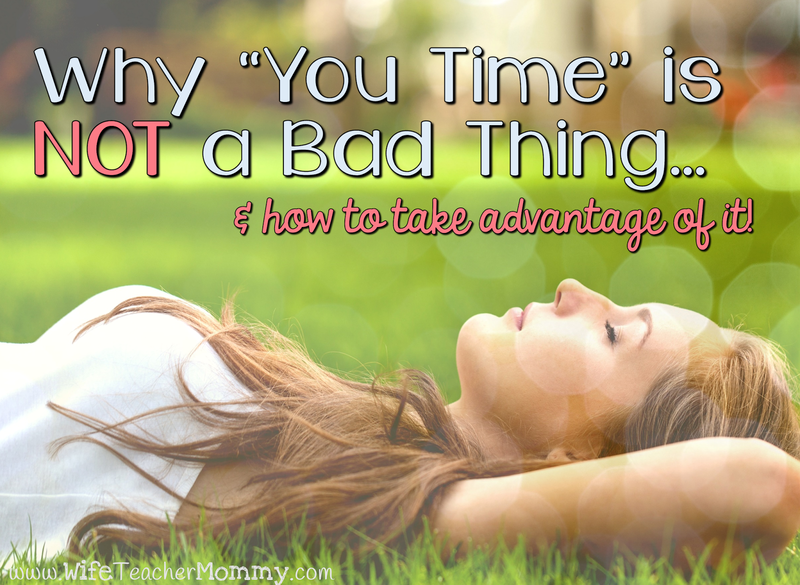 Here are some ways that I incorporate “me time” into my life. Remember, these are some things that I enjoy doing, but that doesn’t mean it will be exactly the same for you! I put this one first because this is one of my first go-to’s when I’ve had a rough day. Relaxing in a warm bath helps me to let go of any stress from my day and also relieves any aches and pains I’ve felt from working hard during the day (especially right now while I’m pregnant!) Sometimes I just sit back and relax, or I’ll read articles on my phone or occasionally a good book. While I don’t always feel like doing it right away, I’ve never once regretted time spent exercising! It helps to lift my mood and get rid of any anger or frustration from my day. It also make me feel better, inside and out! I enjoy Zumba classes, going on walks with my family, and doing exercise DVDs. My current favorite workout DVDs are Amy Dixon’s Give Me 10 and Give Me 10 More because I can get a workout in as short as ten minutes. 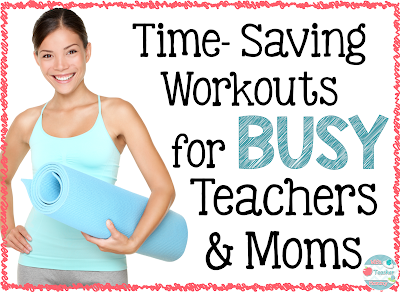 I even wrote a post about Time Saving Workouts for Busy Teachers and Moms. 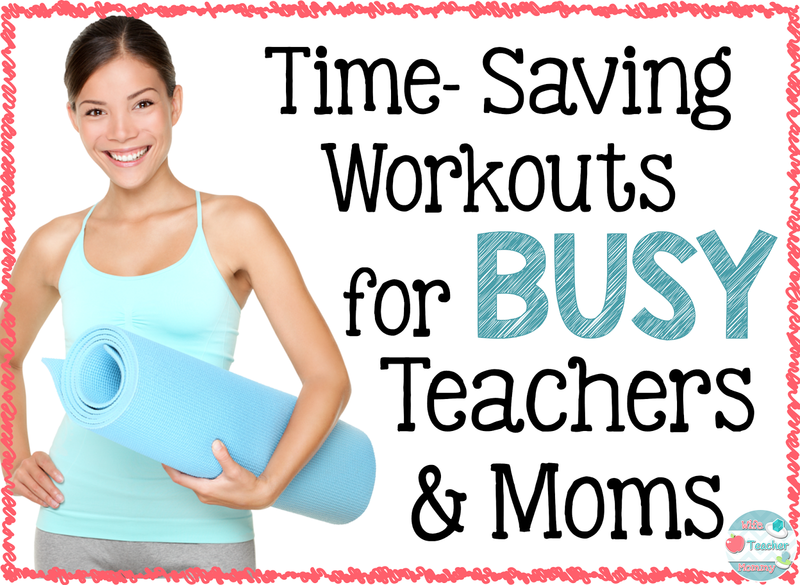 This post outlines ways to include exercise into your busy schedule. 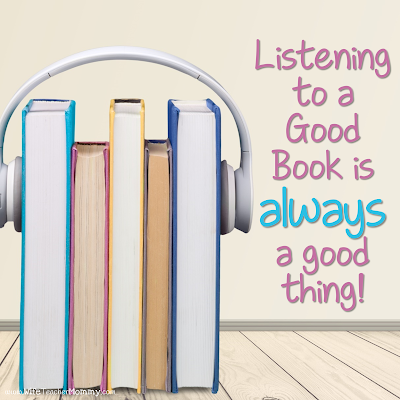 In addition to reading paper books, I have found that I also LOVE audiobooks! I’ll be honest, I was hesitant towards audiobooks at first. When I married my husband, he was always listening to audiobooks and I didn’t understand why you would want to listen to a book instead of reading it. It took him a while, but he finally got me to try it, and let me just say I’m glad he did! The narrators on many of the audiobooks do a great job at bringing the characters to life, and I can sit back and listen. Since you don’t have to be sitting and reading, I’ve found audiobooks to be great for multi-tasking! I can listen to an audiobook while running/walking, cleaning my house, even driving. I loved listening to audiobooks on my 30 minute commute to and from school. It turned the frustrating “traffic jam” time into some “me time” that otherwise would not have fit into my day. It’s a great way to escape and get lost in the world of a book- wherever and whenever! I can zone out and temporarily forget about that never-ending to-do list. If you would like to give audiobooks a try, I highly recommend Audible! My husband and I have been using it for years now. Each month, you can get credits towards a book (or books, depending on your plan) and you can keep all of your books in your Audible library. Audible is an Amazon.com company, so it is very reputable and trustworthy and I have found them to have great customer service. They have let us return titles we did not want to keep after listening to them, because of their “Great Listen Guarantee.” But the best part is, you can get two free audiobooks just by sigining up for a free trial, and you can cancel at any time! There is literally no reason NOT to try it, and even if you decide it isn’t for you, you get to keep the 2 free titles in your library. Click Here to Try Audible and Get Two Free Audiobooks! I love listening to music to put me in a better mood. When I’m feeling down, I can turn on a favorite song and it lifts my spirits. It’s fun to find new songs and artists to listen to as well! I love discovering new artists using Prime Music. If I love something enough, I’ll buy it, but you can stream music anytime with a Prime membership! You can get a free 30 day trial of Amazon Prime which includes Prime music! Click here for your free 30 day trial! My local library also has a program called Freegal, which gives each member 5 free song downloads each week (and it’s totally legal, since it is funded by the library). Check if your local library offers this program! I love digital scrapbooking! It is so relaxing to me to put together pages of my family’s memories and write about them. Not only do I enjoy doing it, but it creates a memorable keepsake that can be looked at for years to come! They also make a wonderful display. 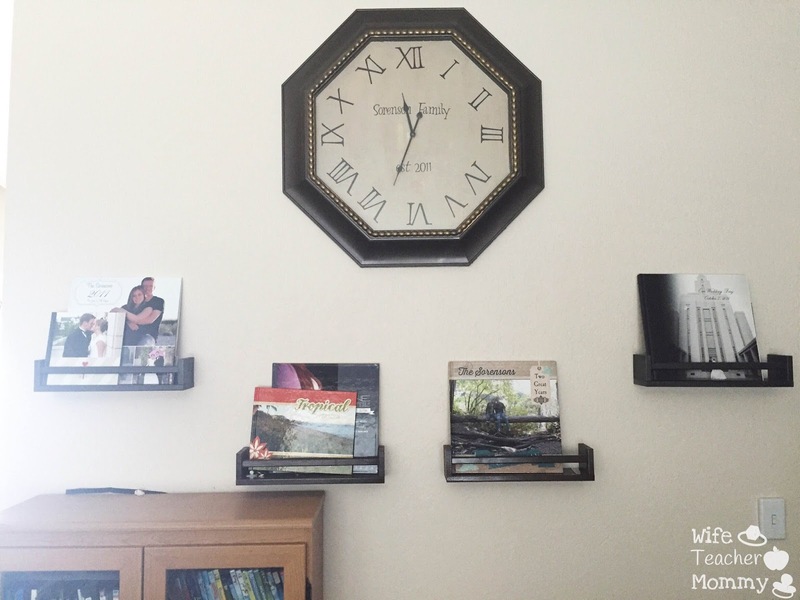 I display my books on DIY bookshelves made from Ikea Spice Racks! 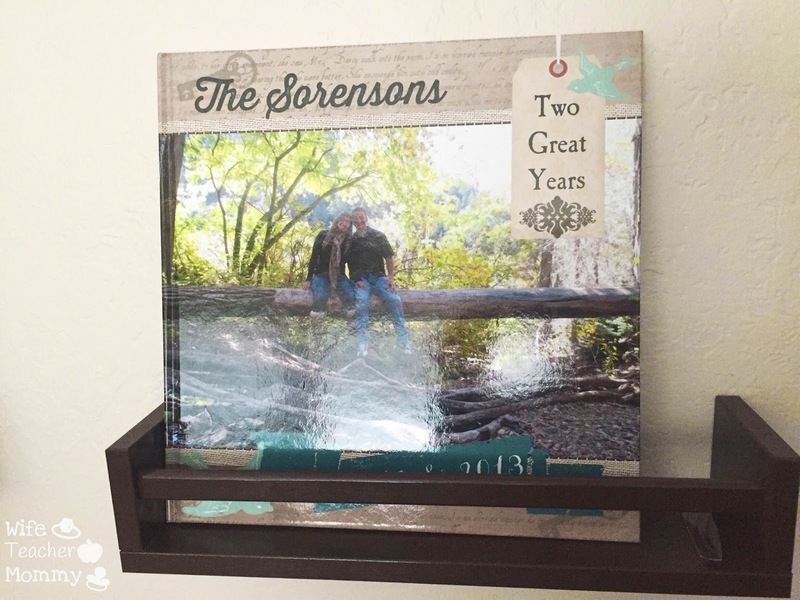 My husband loves that I make these books so we can pull them out on occasion and look at all of our memories together. I use Mixbook to create my photo albums. What I love about Mixbook is that the editor is SO easy to use! 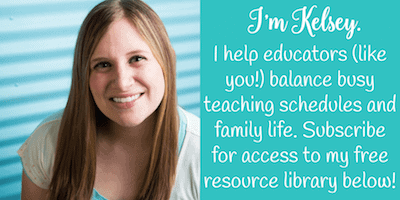 They have pre-made templates and themes that you can use for your books! I often start with a pre-made template and customize it to my liking. There are tons of graphics, stickers, and fonts that you can use in your album without having to download anything to your computer. It is MUCH easier to use than other similar websites I have tried, such as Shutterfly. I am always so pleased with how they turned out. I just love them! I’m currently working on my 2014-2015 album (hoping to get more done before our baby comes this August!) The best part about using Mixbook is that you don’t pay a dime to use the service until you actually order your book! So you can play around with it as much as you’d like to see if it’s for you! Additionally, they regularly run 50% off sales so I ALWAYS wait until a sale to order my books. Click here to check out Mixbook! My husband and I love to binge watch shows on Netflix and Comcast On Demand! Some of our all-time favorites are The Blacklist, Parks and Recreation, How I Met Your Mother (except the ending! ), Arrested Development, Superstore, and Psych. I am a girly girl at heart, and I love going shopping and pampering myself! I love finding a new outfit with matching jewelry, especially when it is on sale. It can also be fun to splurge every once in a while to get my nails done with my mom and sisters. Even though outside appearance isn’t the most important thing, when I take the time to make myself look good on the outside, it helps me to feel happier and healthier. It makes me feel like I still matter and that I’m not the teacher mom who just “let herself go”. I’m still me! I am a religious person, so when I am getting very stressed out I can pray or read my scriptures and feel peace and know that everything is going to work out. I don’t do this as often as I feel I should, but when I do it does help me! If you’re a religious or spiritual person, this can help you through the burn out as well! While you’re here, don’t forget to sign up for my mailing list to get an exclusive freebie sent to your inbox today! What do YOU enjoy doing for your “you time?” Post your ideas in the comments!